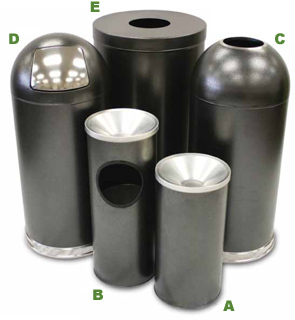 Collection of 'Granite' finished waste receptacles that are complementary to a variety of décor styles and color palettes. With an array of stylish designs to meet almost any requirement each model is crafted from durable fire safe steel. Rolled-Under bottom rims aide in keeping floors maintaining their scratch-free best. All receptacles include a liner except the (A) ash urn – of which does not require one. (B, C & D) Include a galvanized steel liner while (E) comes with rigid poly liner.